In an 8x8-inch baking dish, toss the grapes with the balsamic glaze and spread in a single layer. Roast until they’re soft but still hold their shape, about 15 minutes. Set aside. Look for balsamic glaze near the vinegars at the supermarket. 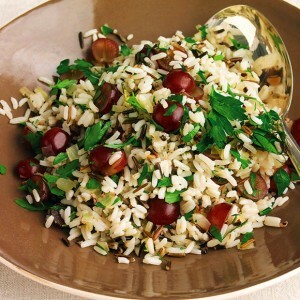 Super Store’s President’s Choice Rice Blend a medley of white, brown, basmati, red and wild rice worked very well in this recipe. If you just want to use just Wild rice here’s the directions: Bring 1 quart of water to a boil in a 4-quart saucepan. Add the rice and 1 tsp. salt, turn the heat down to maintain a gentle simmer, cover, and cook until the grains are tender but not split open, 45 to 55 minutes. Drain in a colander.